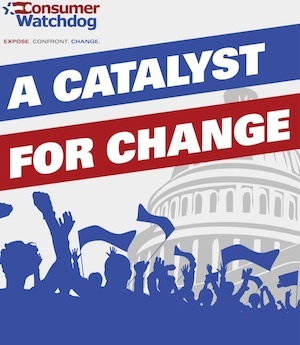 Consumer Watchdog is a nonprofit organization dedicated to providing an effective voice for taxpayers and consumers in an era when special interests dominate public discourse, government and politics. We deploy an in-house team of public interest lawyers, policy experts, strategists, and grassroots activists to expose, confront, and change corporate and political injustice every day, saving Americans billions of dollars and improving countless lives. You can also read about our victories and goals by viewing this PDF of this feature produced by the team at the Sacramento News & Review. In 1985, consumer advocate Harvey Rosenfield founded Consumer Watchdog (originally the Foundation for Taxpayer and Consumer Rights) as a California-based organization to conduct research and public education around issues of consumer protection and political reform. Over the years, Consumer Watchdog has fought to save consumers more than $100 billion on their auto insurance, exposed and changed the inhumane practices of health insurance companies, prevented oil companies from ripping off motorists, won privacy protections for consumers and blocked taxpayer bailouts of utility companies.